In perhaps the most public admission of its automotive ambitions, Apple in a statement issued to the NHTSA in November proposed a policy update that would grant industry newcomers the same opportunities as established manufacturers when it comes to testing on public roads. In a letter to the National Highway Traffic Safety Administration, unearthed by VentureBeat, Apple director of product integrity Steve Kenner says the Federal Automated Vehicles Policy (PDF link) paves a safe and flexible path toward the development of automated vehicles, but suggests proposed regulations could be more open for companies new to the industry. The proposed policy was introduced by the Department of Transportation and the NHTSA in September as a set of regulations designed to govern the coming driverless car future, a scenario that could see technology firms like Apple and Google intermingle with the likes of Ford, Toyota and Volkswagen. Kenner in part echoes recent offhand affirmations from Apple CEO Tim Cook that the company is interested in bringing machine learning and automation tech to the personal transportation arena. The letter goes much deeper, however, outlining specific areas of attention and potential regulation modifications that suggest Apple has been investigating the space for some time. In particular, Kenner says at least three ethical dimensions require attention: implications of artificial decision making on safety, mobility, and legality; ensuring privacy and security in automated vehicle design; and the impact driverless vehicles will have on the public good, for example employment. As can be expected, Apple suggests open sharing of anonymized data —without infringing user privacy, of course —from crashes, near-misses and the similar incidents toward the construction of a comprehensive dataset to be accessible by all industry players. Such collaborative methods would help carmakers design and deploy increasingly accurate driverless systems, Apple says. While Apple seconded a number of banal policy proposals, the company took issue with certain exemptions for internal development testing. Specifically, Kenner notes the proposed policy's wording suggests companies need prior exemption for public road testing of vehicles not compliant with Federal Motor Vehicle Safety Standards. The federal government requires auto manufacturers test upcoming vehicles on public roads, and to that end recently added a Fixing America's Surface Transportation (FAST) Act proviso that allows "established manufacturers" to conduct such tests without an exemption from FMVSS. That same document does not present the same opportunity to "new entrants." "To maximize the safety benefits of automated vehicles, encourage innovation, and promote fair competition, established manufacturers and new entrants should be treated equally," Kenner writes. "Instead of applying for exemptions, all companies should be given an opportunity to implement internal safety processes summarized in a Safety Assessment." Though the NHTSA is unable to modify the FAST Act, it can update the Federal Automated Vehicles Policy to bypass the requirement for exemptions, thus streamlining road testing for companies like Apple. 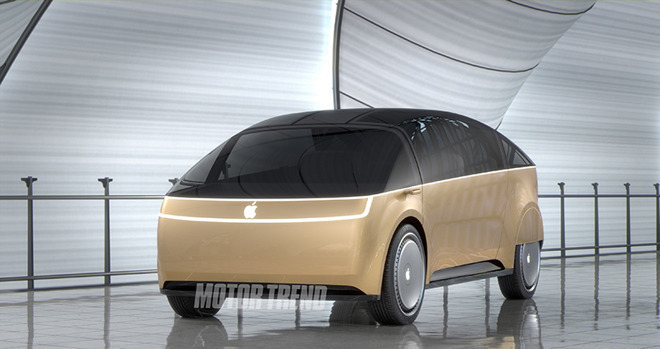 Rumors of Apple's interest in creating a branded car surfaced early last year. Dubbed Project Titan, the internal initiative was reportedly staffed by more than 1,000 engineers and other personnel working out of top secret labs in Sunnyvale, Calif., some of whom were pulled from important consumer product teams. After what seemed to be an aggressive ramp up in development funding, Project Titan ran into trouble last September when sources said top executives expressed displeasure with the group's slow progress. Subsequent reports indicated the team faced mounting unforeseen obstacles that ultimately culminated in the axing of dozens of employees.